Another month has come and passed which means it’s time to reveal the December Simply Earth Essential Oil Recipe Box! As always the month’s theme fits perfectly with all of the oils and recipes geared towards relieving congestion, cold symptoms, and tension. This month I’m actually sharing each of the recipes with you and many of them would make great gifts! Make sure to pin this post for future reference so you can make the fun essential oil DIY’s whenever you want! All of these holiday essential oil DIY’s are from the December Simply Earth Subscription box with a few additional common household items. 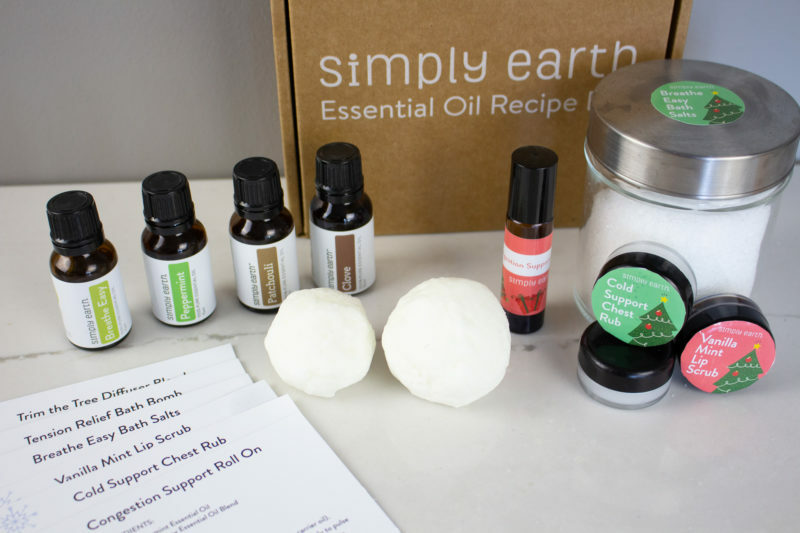 The December Simply Earth Subscription Box is so perfect for the holidays. I almost ordered each of the oils individually back in November, but luckily Simply Earth reveals their next month of oils so I held off knowing that they would come in December. Stay tuned for some winter diffuser recipes using these oils and others! As mentioned in the intro, the DIY recipes are perfect for this time of year. It’s cold and flu season, and I think every family could use a little respiratory support to help them get through these congesting months. Many of the DIY’s would make great gifts, and with having the core necessary ingredients included in the box, it’s easy to make multiples. This is the first box I’ve received where many of the ingredients weren’t included in the Simply Earth Subscription Box. That being said, they were all items I already had in my house. I did not need to purchase anything extra. The only item I could imagine you possibly needing to purchase is the epsom salt, and it doesn’t hurt to have some in the bathroom! A big bonus with tons of bottles and carrier oils (see my August unboxing for a full look). It’s seriously the best freebie! $20 gift certificate to use in their shop. You can use this to grab some extra carrier oils or some of their awesome essential oils blends, or anything else you fancy. As mentioned, most of the supplies required for these DIY’s are included in the December Simply Earth Subscription Box and Big Bonus Box, with any additional supplies likely found in your pantry and bathroom. These Essential Oil DIY’s are perfect for relieving symptoms of the cold and flu season and would make great Christmas gifts. This roll on is great for clearing nasal passages and relieving congestion. Safe on children 10+ years of age. Add essential oils to roll on bottle. Fill the rest of the way with Almond Oil (or other carrier oil). Apply to pulse points and breathe in. Your DIY Vicks Vapour Rub. Apply to chest to help clear nasal passages and promote sleep. In a double boiler melt beeswax and coconut oil. Pour mixture into a small jar and allow it to cool and solidify. Use a finger to naturally exfoliate your lips. This holiday DIY would be great for gift giving! In a small bowl mix all ingredients and store in small jar. Pour entire mixture into a warm bath for respiratory support and congestion relief. Pair with slippers and tie together with a ribbon for a great self care Christmas present. In a small bowl mix essential oil and fractionated coconut oil. Stir in salt and store in a small sealable jar away from water. Drop bath bomb into warm bath, sit back and relax, and feel your stress and congestion ease away. This recipe may sound like it’s a lot of ingredients but it’s actually really simple to make. That being said, I did have trouble using the bath bomb mold and found it easier to mold by hand. I may have been packing it too much, but it worked just fine molding them by hand. They aren’t quite as pretty but they’ll work all the same in the bath. In a bowl, mix all dry ingredients until they are well combined. Melt the coconut oil and add the essential oils. Mix together. Slowly add small amounts of water while quickly stirring until the mixture is like wet sand and will form a clump in your hand. Loosely pack mixture into each half of the mold. Let your bath bomb rest in the mold for 5 minutes before using the mold aain to create your other bath bomb (add water again if necessary to reach correct consistency). Take them out of the molds and let them dry for 24 hours before using. I really enjoyed making this month’s DIY’s and find all of them to be so helpful. The breathe easy bath salts and vanilla mint lip scrub would be great for gift giving, and the mix of oils, along with others that are commonly found will make some great diffuser blends (stay tuned for a blog post coming soon). This truly is the perfect subscription box for natural mamas. For less than the price of 2 oils from competing companies you are able to grow your oil collection and learn how to create a more natural home. Do you have a favourite holiday DIY gift? Let us know in the comments below. I love a good chest rub and bath bomb!